New posts as they are written. Grand Central is welcoming a big brother to the left. Anyone taking the train from Greenwich or Westchesterover the past year has no doubt seen the construction cranes, crews and the scaffolding signaling something new on Madison and 42nd. What is to go there is a long sought- after 65 story commercial building by developer SL Green designed by architects KPF. 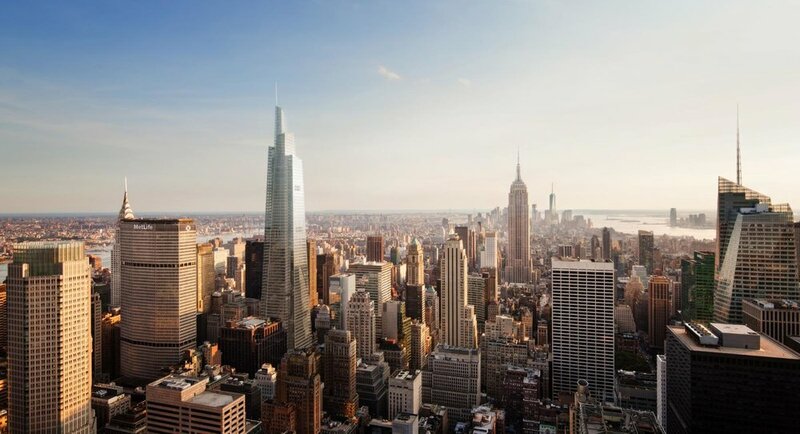 One Vanderbilt is set to become the tallest office tower in Midtown at 1,400 ft tall & will be connected to Grand Central via an underground concourse similar to the World Trade Center. The tower join The Empire State Building and The Chrysler Building as one of three point towers to define the city’s renowned skyline. As a by product of a Midtown East Zoning Change under DeBlasio, the development includes infrastructure and transportation upgrades for commuters as part of the deal struck with the city. There will be direct connection from One Vanderbilt to the subway, Metro North and the future LIRR. In addition, the developers are building a 4,000-square foot public transit hall on the ground floor of One Vanderbilt. Vanderbilt Avenue between 42nd and 43rd Streets will be converted into a 14,000-square-foot pedestrian only plaza. All of these improvements will in turn ease congestion, city officials say, and will allow for one additional train per hour on each side on the 4/5/6 and create space for 1,100 more passengers in each direction as well. Aug 22 Shigeru Ban's "Ship in a Bottle"
Rick Kelly is a Top Real Estate Broker in New York City, Specializing in Luxury Property Sales and Rentals.